Way back in July, I participated in a wonderful Swap-bot swap called My Stationery is not Stationary, hosted by the lovely PostMuse. She sweetened the deal with a giveaway on her blog, too. ...plus a little glitter-pen embellishment to the deco tape. 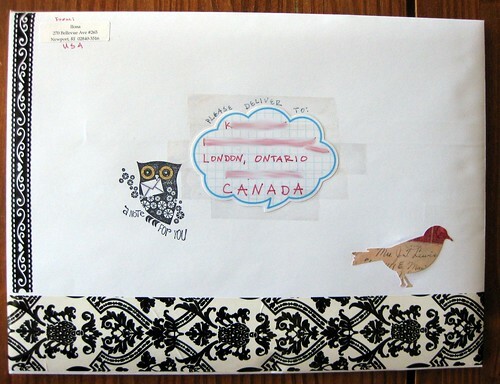 The recipient liked birds, so I used a bird theme for the stationery and used more birds on the envelope. PostMuse later did a summary of the swap, with her wonderful follow-up, if you're looking to read more about it. It was one of the best swaps I've participated in - thoroughly enjoyed it. Thank you, Missive Maven! I will be doing another stationery swap on Swap-Bot in 2011, though probably not until spring. I love that deco tape -- I wish it could be a wallpaper border in my bedroom! OHHHhhh too funny to open your newest post in my RSS reader and go I KNOW THAT ENVELOPE! PostMuse - I'm excited for your swap, whenever you have it. I am selfishly glad you won't host one until spring, because I'm going to be so slammed until then that I probably wouldn't participate! Kataish - very cool! I always do a delighted double-take when I see mail I've sent or received on other blogs.